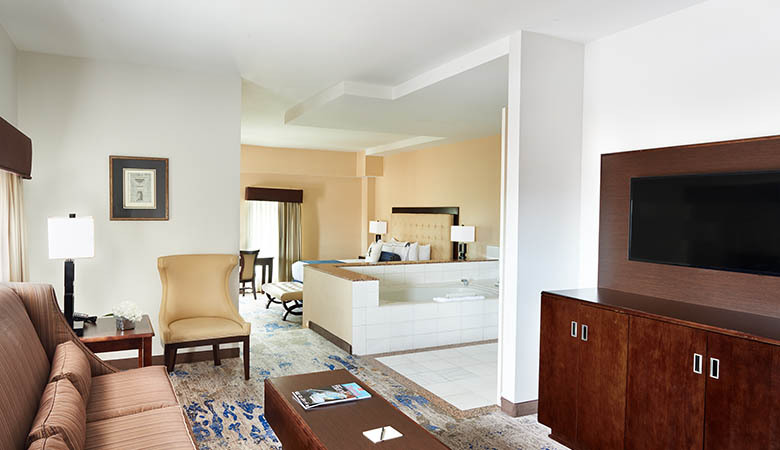 Our 174 elegant suites feature skyline views and indulgent marble bathrooms with whirlpools or deep soaking tubs. 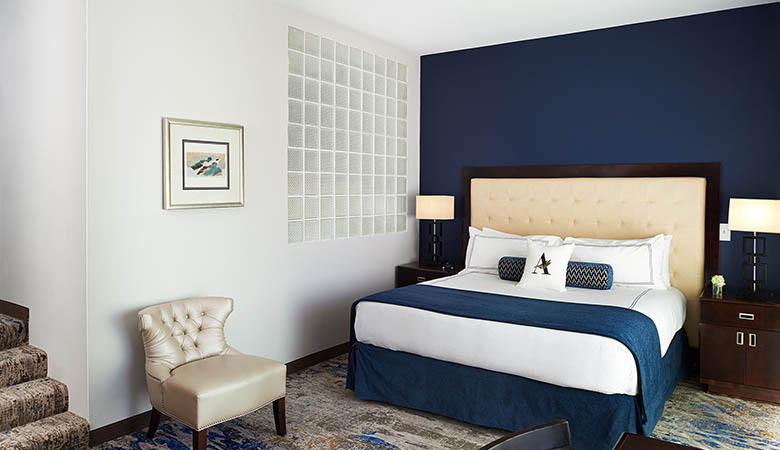 Each suite offers complimentary wireless internet, in-room safes, refrigerator, iron, ironing board, hairdryer, and coffee makers. Handicapped suites are also available. 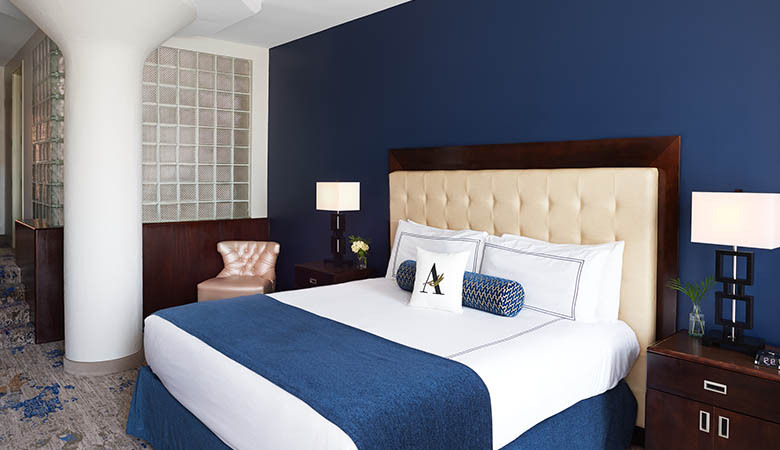 This charming guest room offers 360 square feet of living space and features a queen size bed and marble bath. This quaint sleeping room offers 460-610 square feet of living space and features a king size bed. This spacious two-room suite offers 580-710 square feet of living space and features a living room and sleeping room with a king size bed. This spacious two-room suite offers 580-710 square feet of living space and features a living room and sleeping room with two queen size beds. Living room and bedroom with two queen size beds. This large upscale suite offers 680-710 square feet of living space and features a living room and a spectacular elevated marble whirlpool bath overlooking a king bedded sleeping room. This specialty suite offers 1,100 square feet of living space and features a luxurious sitting room with a dining table, wet bar, plush sofas and a large screen TV along with a king-bedded sleeping room with a marble whirlpool bath. This impressive suite offers 1,300 square feet of living space and features a stunning living room with a wet bar and large screen TV along with a king-bedded sleeping room with a marble whirlpool bath. Two room suite with a living room and a separate bedroom with a king bed. Spectacular living room with wet bar. High ceilings with a stunning skyline view. A king-bedded sleeping room with a marble whirlpool bath. This stunning suite offers 1,000  1,380 square feet of living space and features a spectacular living room with plush sofas, dining table and wet bar and a large screen TV along with a king-bedded sleeping room with a marble whirlpool bath. Two room suite with living room and separate bedroom with a king bed. Spectacular living rooms with plush sofas, dining table and wet bar. This magnificent two-bedroom suite offers 1,525 square feet of living space offering a stunning city view and a spectacular living room with conference table and marble serving bar. 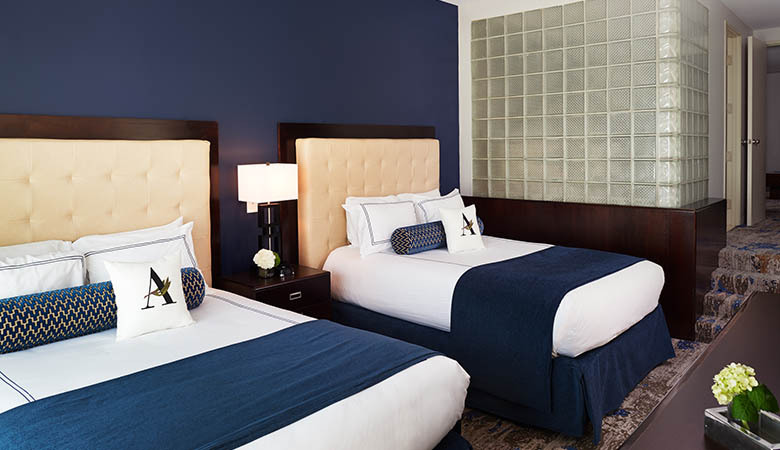 Bedrooms feature one with king bed and one with two queen-beds; both include marble whirlpool baths. Three room suite with a living room and two separate bedrooms, one with a king bed and the other bedroom with two queen beds. Spectacular living rooms with plush sofas, dining table and marble serving bar.